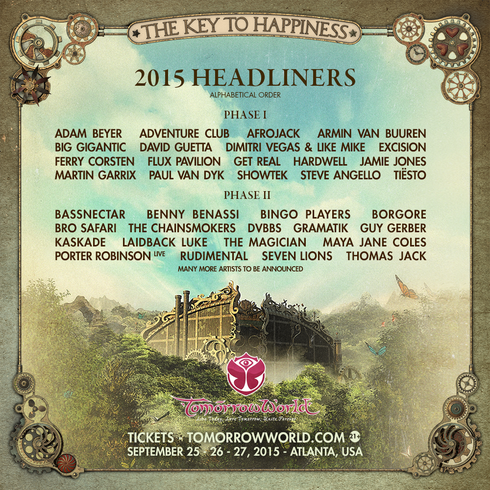 TomorrowWorld recently announced its Phase II headliners featuring Kaskade, Bassnectar, Bingo Players and more. Following its Phase 1 Headliner lineup, and recent stage curator announcement including The Magician and Thomas Jack, TomorrowWorld further solidifies its position with more music programming. Its Phase II headliner announcement highlights an eclectic array of artists such as Benny Benassi, Laidback Luke,The Chainsmokers, DVBBS, Guy Gerber and Maya Jane Coles as well as performances by Porter Robinson and Rudimental on the L!VE Stage. With only a few months until the gates open on 25 September, TomorrowWorld demonstrates why it is one of America’s main electronic music festivals. Nestled in the rolling foothills of Chattahoochee Hills, Georgia, TomorrowWorld aims to transport its festival-goers into a fantasyland unlike any other for its third edition. Attendees should be prepared to step into a fairytale and immerse themselves in the festival grounds, seven stages of madness, and hundreds dance music artists.